I won’t lie to you, readers, and tell you that I’m a gardener. My approach to the backyard is sort of the “survival of the fittest” attitude; if it grows, excellent. If a particular plant can’t cut it, I don’t have the time (particularly in the spring) or the motivation to coax something to bloom. Last summer, the back yard here at the dollhouse looked phenomenal. To be fair, I didn’t move in until the first weekend of August, so the beautiful flowers that were rocking out back had nothing to do with me. I will take your congratulations for keeping them mostly alive until the snow fell, but I can’t take credit for plant selection or management during the all-important first few weeks of growing. Because I had my hand surgery June 1st this year, I didn’t get the jump I wanted to on the gardening, so whatever has happened back there grew on its own. My momma, cousin, and auntie visited today, and we sat out in the garden after lunch. Momma has a tough time sitting still, even when she’s supposed to be on holidays, so she pulled a few weeds and trimmed back some of the plants bullying the other stuff in my garden. Here are my favorites that have proven themselves by surviving so far this summer. I’ve used the hose once all season, so the pretty things that are thriving back there are doing so by themselves with a little support from the weather. Keep in mind that I’m neither gardener nor photographer, so be kind on my efforts with my little Canon point and shoot and my blowin’ in the wind approach to my yard. If you have any clue what these plants are, since I don’t know what most of them are called, please let me know so I can refer to them with better titles than “that blue thing that keeps growing across the sidewalk” and “the pink thing that comes back no matter how many times Sherman pees on it.” Thanks in advance for your help, dedicated gardeners. 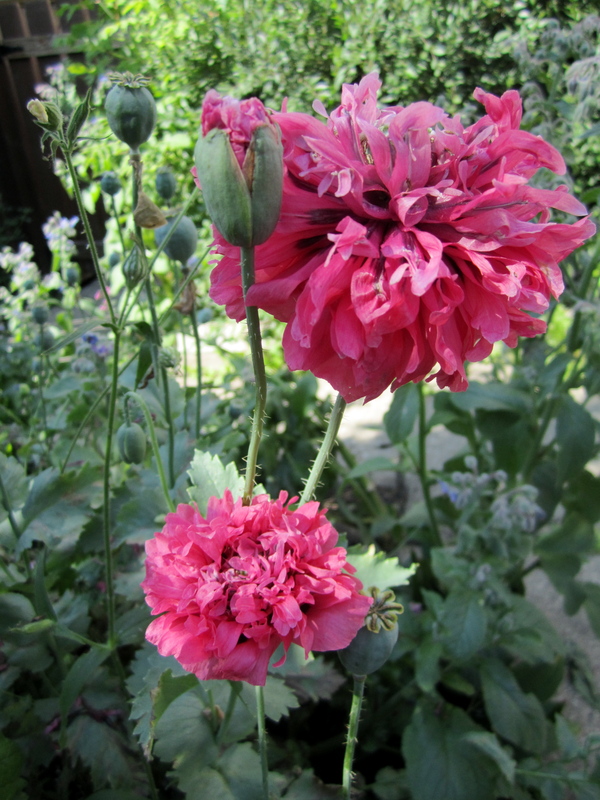 I know these are poppies, but I'd love to know the proper name of this colour. Poppies seem to do very well out back for some reason. I thought I’d killed off all the ones that bloomed like mad last summer through sheer neglect, but they were up and fabulous when The Electrician and I got back from B.C. I get dozens and dozens of them at once, and I unfortunately missed photographing them when they were at their peak. When they’re fully open, they resemble rah-rah old school cheerleader pom-poms. Did I mention that they’re SO pink? That’s the best part. These snuck up on me. I have truly no clue about these deep purple things. In fact, I just found them yesterday, growing the shade under some kind of tree on the walkway out to the alley. Auntie thought they might be ladyslippers, but wasn’t sure. Each flower is about the size of my (small) thumb and they bloom out of little bean-looking things. I think they’re really pretty, but I’ve never seen anything like them before. Careful, or you'll get stung. 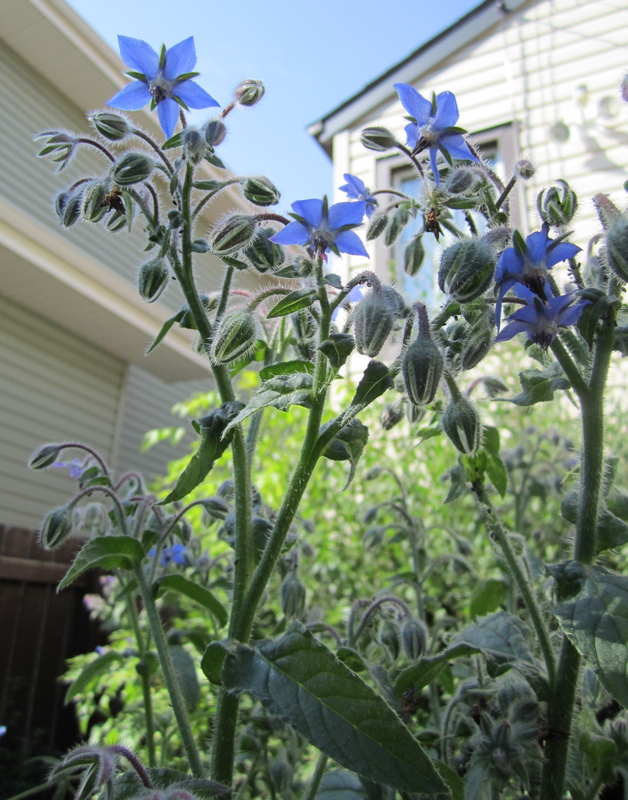 These blue star ones are also a mystery; they don’t have a noticeable smell or visible pollen, but they are always crawling with honeybees. Even when they’re fully open, the flowers point downward so I had a hard time getting a shot of them without aggravating the bees. Did I mention that they grow out over my sidewalk? I step carefully in the day time when our buzzy buddies are hard at work back there. I love that they’re SO blue, when a true blue is hard to find in flowers and I don’t much care for the purple colour family. Most days, the lower ones smell like pee. Sherman likes to pee at the corner of the deck where these little beauties bloom. Last summer, they grew up to the top of the raining and the whole yard smelled divine in the evenings because of them. This year, the hail, stupid monsoon-style rains, and dog pee have kept them pretty short, but I’m hoping they’ll rally before the growing season is over. The flowers are itty bitty, maybe about the same diameter as an M&M for each bloom. These are popping up all over. 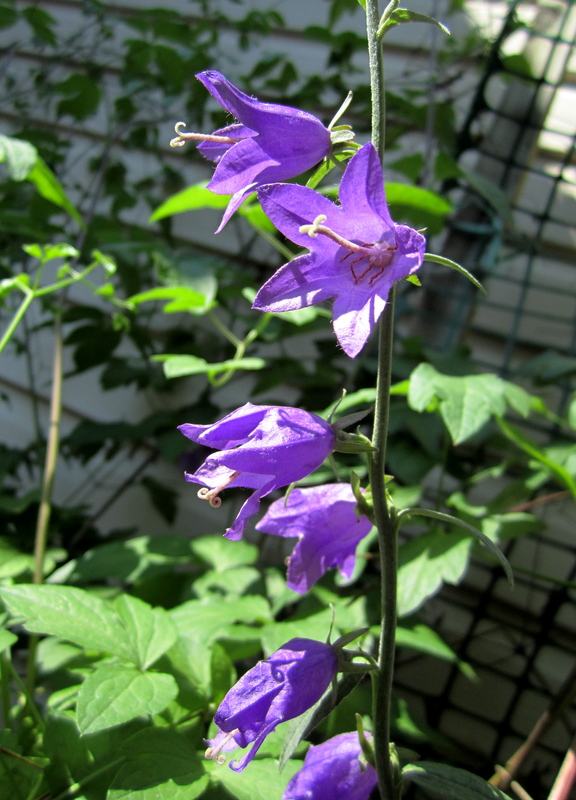 Growing randomly all over the back yard, these deep violet bells keep popping up. 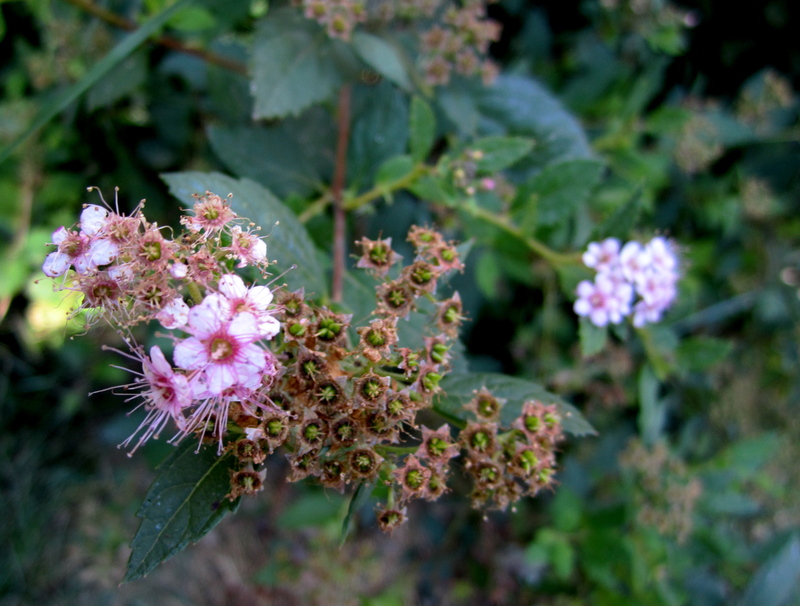 They sprouted up on tall, skinny stems and many have flopped pathetically over in the rainstorms or under Sherm’s feet. From what I can tell, they prefer the shade and bloom in clumps. They look especially pretty against the brown side fence. It has a similar diameter to a ping pong ball. My cousin loved these but none were really seedy enough yet to send some home with her. 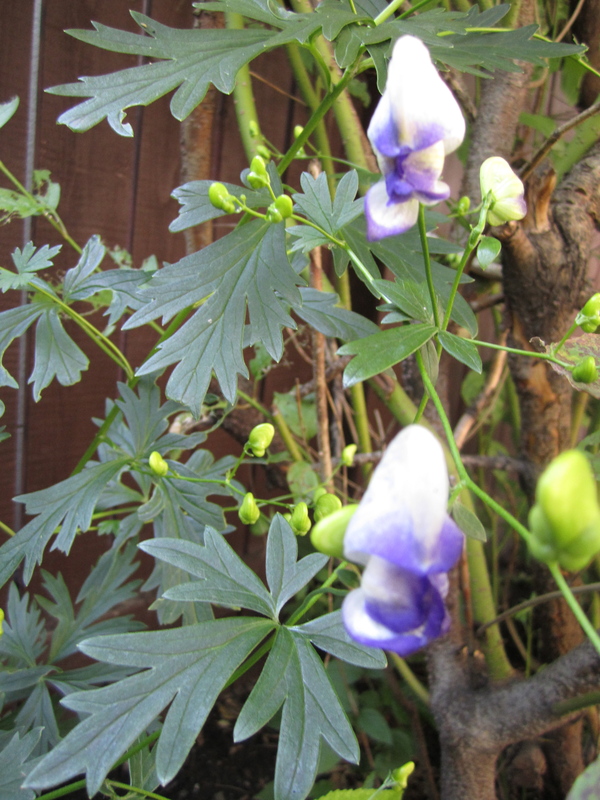 They’re really delicate and growing in the shade by the garage on clumpy vine type stems. I like the soft yellow: it’s a gentle colour and it reminds me of something you’d find in a little old lady’s garden. Yes, I know that big honkin’ leaf in the background is a dandelion. Survival of the fittest, remember? This year, those dandelions are fit, man. 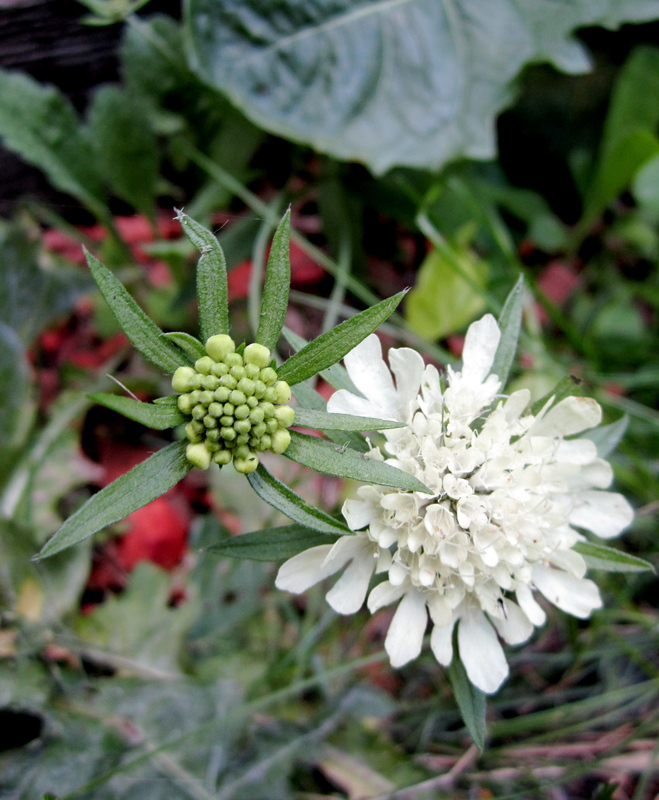 Thanks again for reading, and a big fat thanks for those of you better acquainted with botany than me who can share some information. oooo sorry, I surpass you in the bad gardner realm, which reminds me: When will the world recognize the dandelion as a flower?? It would make so many lives much easier to call it a flower, let it take over the land and be done. They spread with abandon, have lovely yellow flowers, are edible, so what IS the problem??? I actually like dandelions! You’re right about the flowers being lovely, and I really feel like I need to let them be sometimes, since they’ve clearly worked very hard to establish themselves in my yard. I’ll vote to call it a flower along with you.